Because the vast majority of holiday & Christmas photo card templates for photographers are layered Photoshop / PSD files, it’s also incredibly easy to turn on / off layers to customize the design even further. You or your client may not want as many custom text areas as a photo card template offers, for example. No problem! Simply make those layers invisible in Photoshop, adjust and move around additional text layers as needed, and you’re good to go. Let’s talk more about text layers. Most holiday & Christmas photo card templates for photographers include a variety of text layers for you to personalize things like your name, the year, and holiday greetings and messages. Template designers often use free fonts for these text areas, and in your download the designer will include a file that lists the fonts and links to where you can download them (or purchase them, if paid fonts are used). This makes it super easy for you to get the fonts that you need for the photo card templates if you don’t already have them. But let’s say that you would prefer not to use the same fonts that the template designer used when they created the template. Also no problem! You can easily choose any font that you have and switch it out with the one that the original designer used. This offers endless possibilities to further customize the template. Backgrounds for photo card templates are also typically on their own layer, which presents even more creative possibilities. Maybe you love everything else about a template but the background just won’t go with the photo that you have your heart set on using. You can make the background invisible if the background design just won’t coordinate with your photo no matter how you alter it. In this case, a clean white background may be just what you need, or you can try other solid color backgrounds to see if something besides white might look even better. And if you have your own custom textures and patterns, you can easily paste them into their own layer in the photo card template for a look that’s tailored to fit your photo. On the other hand, say you absolutely love that custom watercolor background, pattern, or other background design in the original template but the color isn’t quite the perfect fit for your photo. Photoshop’s Layer Style and Layer Adjustment options are really helpful here. You can experiment with those to adjust the color of background to be just what you want, and you can also play around with Hue & Saturation and Color Balance to adjust the colors. There really are so many creative possibilities that you can explore with just one template. You can change colors, perhaps even use faux metallic textures, adjust and customize text areas to your heart’s content, switch out fonts for a more custom look, play around with background options, and so much more! 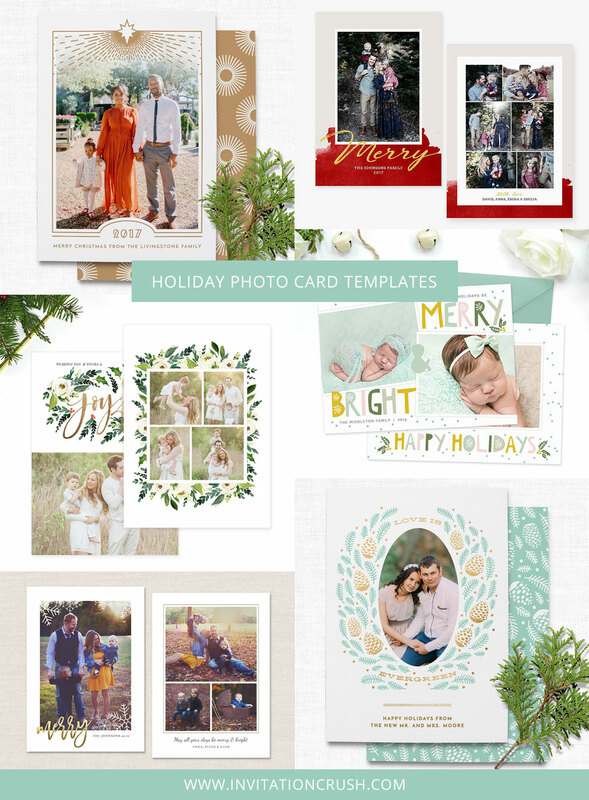 Holiday & Christmas photo card templates are such an economical and versatile way to build your collection without having to design it from the ground up. This inspiration gallery features some of my absolute favorite Holiday & Christmas photo card templates for photographers. Among these beautiful designs, you’ll find watercolor floral and botanical designs, templates that feature brush lettering and artistic brushstroke elements, typographic holiday card templates that are clean and oh so chic, minimalist modern designs that are perfect for anyone who loves plenty of white space, whimsical designs with festive color and lettering, and designs that offer faux metallic options. And that’s just the beginning!